An American lady sips nectar from clover. It seeks out pussytoes and everlastings for laying its eggs. Many folks in Westborough have noticed that it looks like a good year for butterflies. Among other butterflies, the ladies back. What ladies, and back from where? For one, you might spot American lady butterflies (Vanessa virginiensis), also sometimes called hunter’s butterflies or Virginia ladies. They are medium-sized butterflies, with a wingspan of about 2 inches. They’re patterned in orange and black/brown when viewed from above, as when they bask in the sun with their wings open. The undersides of their wings are less colorful, as you’ll see when the butterfly perches with its wings closed and upright,. They’re patterned in browns and greys, with two large eyespots and a splash of pink. In our area, many of these butterflies appear in May-June, after overwintering as pupae. In this life stage, the caterpillar transforms into a butterfly, safe inside a camouflaged case called a chrysalis. Some adult butterflies in our area may also hibernate, but it’s uncertain how many survive our winters. These days we often hear that monarch butterflies migrate, and we may even have noticed that many monarchs seem to be flying in the same direction (south) in September. But monarchs aren’t the only butterflies that migrate. Some American ladies that we see in the spring may have flown north to get here from warmer, more southern locations..
You might see American ladies taking nectar at a variety of flowers, including the clover in our photo. But look for American ladies particularly near pussytoes (Antennaria plantaginifolia, Antennaria neglecta), pearly everlasting (Anaphalis margaritacea), sweet everlasting (Gnaphalium obtusifolium), and burdocks (Arctium species). Why these plants? The female American lady butterflies lay their eggs on them, since they are the food plants for their caterpillars. If you find pussytoes or everlastings in a field or along trails, or if you grow garden varieties, check for the caterpillars. Each caterpillar makes a shelter on a food plant by tying leaves together with its silk. Then it feeds inside. While you’re looking for butterflies, keep your eyes open for another lady that also sometimes makes an appearance in our area – the painted lady butterfly (Vanessa cardui). This butterfly is a strong flyer and may fly 1,000 miles. It’s known for migrating north every year, as far as Canada, from the southwestern U.S. and northern Mexico. Its long, fast flight is fueled by fat stored up during its caterpillar stage. Each year it repopulates areas with cold winters, but its numbers tend to vary greatly from year to year. 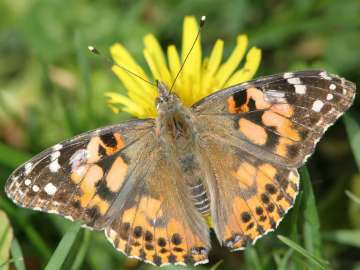 This painted lady, or thistle butterfly, may have migrated from the American southwest or northern Mexico to get to Massachusetts. It lays its eggs on thistles, as well as various other plants. It’s found on several continents and is the most widespread butterfly in the world. Painted lady butterflies looks quite similar to American ladies. The differences between them are subtle, but the easiest differences to see are on the undersides of the wings. 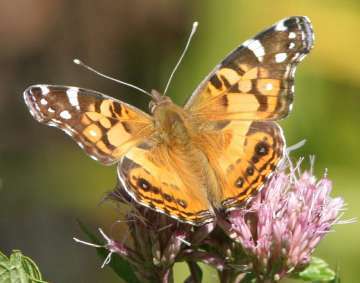 Painted ladies have a row of four small eyespots along the edge of the wing undersides, but American ladies have two large eyespots. If you travel to Europe, Asia, India, Africa, Australia, Central America, or northern South America, you might see a painted lady on your journey. These butterflies are so widespread that they’ve been given the name cosmopolitan butterflies. Thistles are such a favorite food plant of painted lady caterpillars that these butterflies are also called thistle butterflies. Look for painted ladies near bull thistle (Cirsium vulgare) and Canada thistle (Cirsium arvense), but don’t be surprised to find them elsewhere. They can’t be too picky about what they eat if they live all over the world! Caterpillars of this wide-ranging butterfly also eat a great many other plants. Many of these plants are not native here but have been introduced from other places. Let’s hope that this year continues to be good one for enjoying butterflies, whether they’ve hatched locally or migrated surprising distances to get here.